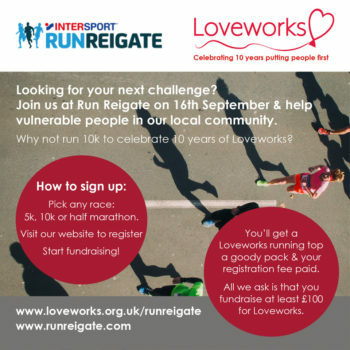 Enter Run Reigate on 16th September in support of Loveworks. Sunday 16th September 2018 saw the award winning Run Reigate take place through the beautiful surroundings of Reigate. This year included half marathon, 10k, 5k and childrens races. Loveworks were delighted to be one of this years charity partners and had three runners sign up for TeamLoveworks who helped raise money in sponsorship to help vulnerable people in our community. Along with the Team Loveworks sponsorship, car park donations helped raised in excess of £750 in profit this year. We would love to build on the successes of this year, and would love YOU to join us as one of our Team Loveworks runners next year. Email us a info@loveworks.org.uk to let us know you have registered and your shirt size. By joining TeamLoveworks, you are agreeing to sharing your personal data with Loveworks and the taking and use of photos. Please email info@loveworks.co.uk if you do not agree.